trackside (Missouri) on 2014-07-02 19:58:03. Take a day trip with the crew as they handle their freight through dark territory without the aid of CTC. The addition of crew chatter on the radio as trains pass is a nice touch. The barren red high plateau lacks appeal yet the lake area and farmlands attract the viewer's interest. The first twenty minutes or so are slow and dull as a freight clears the Keddie Y then is viewed from a distance as it hugs the cliff while running on a yellow signal. Old Timer (Tucson) on 2014-11-18 20:58:52. Excellent DVD of a virtually unknown rail line of times past. Beautiful through the cab views of this not often seen part of the Calif state landscape. Excellent narration throughout the video. Texas Hi-Railer (West Texas) on 2011-08-31 20:25:01. 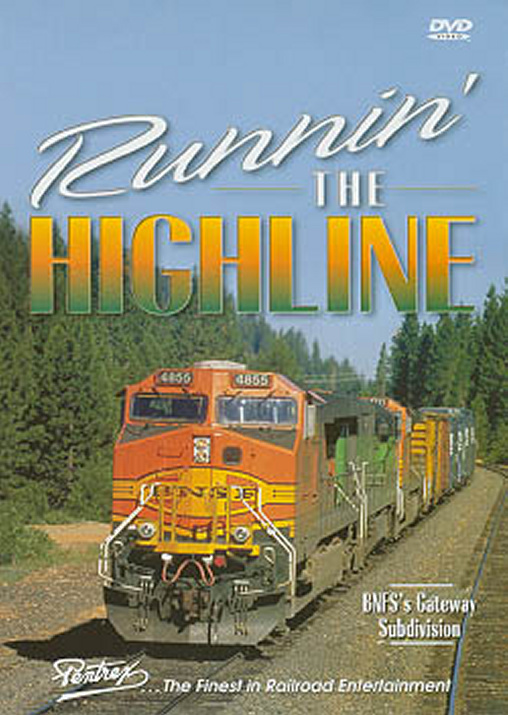 If you're a BNSF fan and you love mountain railroading, then you're going to love this DVD. It covers all sorts of landscapes in different seasons and really shows what it's like when climbing steep grades with these long trains. There's an excellent scene where one train loses a locomotive due to a power loss and that's all I'm going to say on that so that I don't give away the story, lol. This DVD is well worth the money and in my opinion is a "must have" for those BNSF fans out there! Russ (Waco,Texas) on 2011-02-17 06:18:30. Quality of this video is excellent, which is typical of Pentrex. Scenery is magnificent. Content was great. I really enjoy the shots from the cab. It was like being on board. I would highly recommend this dvd to any train enthusiast. Received the DVD promptly. A-1 quality. My only question is will you ever produce a DVD sequel to this one, which shows the route from Klamath Falls, Ore. to the Wishram "Wye" across the Columbia River in Washington? Another great production by Pentrex. Here is a video filled with scenery, and wildlife, in the rugged mountain terrain. with high running, and cuts, valleys and lakes, and the snow capped hills, there is rarely any straight track for any distance, combined with plenty of grades. Occasionally the odd ranch appears to open up the landscape adding even more variety. With on ground shots and cab rides through out the video, we see the line from all angles. Add in the various paint schemes of BNSF, plenty of meets with trains in sidings, maps along the way, even showing the agricultural areas, and You have a great video that will be enjoyed for years to come. An excellent video that will be rated high as a favorite in the collection. WOW. This dvd was GREAT! Pentrex has done it again. Love the cab rides and the scenery is just awesome. Get this dvd today! Lots of radio chatter with the towers which I like to hear. climbing steep grades with forests all around, what more can you ask for? What a place to build a railroad-this is some awesome accomplishment.The video well illustrates the desolate territory this line was built through & the spectacular scenery that this line runs there. I really like the the narrations in the Pentrex videos-things are well explained so that people new to the hobby have a better understanding of things.